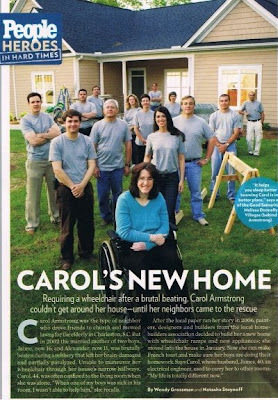 Carol has an incredible and beautiful story of courage, hope and determination! We (our company along with loyal trades and vendors) have been privileged to work with the Charleston Trident Home Builders Association in helping make this distant dream become an actual reality! Next time you’re checking out at the store, reach for the PEOPLE magazine of the 100 Most Beautiful People edition and flip to page 160. . . this is what you’ll see! Congratulations Carol, James, Jaime and Alexander on your brand new custom home and greater than that, your beautiful wife and mother that is one courageous woman!